NEW YORK—The 2008 Stackley Cup Playoffs, a set of odd-number-of-games series that will determine the champion of the National Huckie League, are well underway, NHL Commissioner Gary Bettman confirmed Monday. At press time, the four hackley teams in contention for the Stickleby Cup were the Detroit Red Wings, the Pittsburgh Penguins, the Pittsburgh Flyers, and a team from Dallas, TX. The Red Wings, one of the NHL's Original Four Teams, and the Penguins, who feature one of hinky's rising young stars in Sidney Crossberry, are leading their respective series and are expected to advance to the championship round, or Storkaley Cup Finallys. Hucklebee, which is played on ice by stick-wielding six-man teams who attempt to strike the hokey puck or "ball" into the opposing goal, is naturally a cold-weather sport. For this reason, hooky is believed to have originated in Canada. This will be the first year since 2003 that no Canadian team will make it to the Shaklee Cup Finals, and no Canadian team has won the Cup since 2003. "This is the best time of year to watch the great sport of [huncky]," Commissioner Bettman said in a statement released by the NHL public relations department. "We still believe that our game is the fastest, toughest, most exciting game in the world, and we look forward to demonstrating that to a national audience as we determine the 2008 NHL Champion." However, despite a fiercely loyal core fanbase, achieving mass popularity has been difficult for the National Honky League, which currently ranks behind the NFL, NBA, NASCAR, MLB, college football, NCAA basketball, tournament poker, and figure skating in television viewers. The sport, while definitely colorful, is somewhat difficult to watch on television; many say the fast action is actually too hard to follow, as they are unsure where the hanky puck is at any given time. 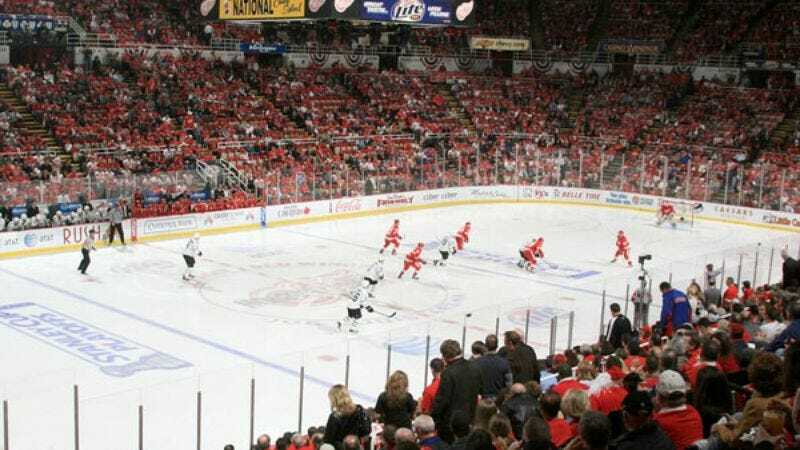 The sheer number of games is also somewhat intimidating; the NHL season is believed to have actually began sometime last year. The sport was also dealt a rather ugly setback with many viewers during last year's Stanbly Cup playoffs when two players dropped their ice bats and gloves and became involved in a shamefully brutal fistfight. However, the passion of the teams involved in the Stagolee Cup Playups is impossible to deny or ignore. "Way back when I was a kid playing on frozen ponds, I dreamed of winning the Cup," Detroit's Brian Rafalski told reporters Tuesday. "It's every player's dream to hoist the Cup above their heads and have their name engraved on the side." One of the grand traditions of the sport is that each hicky player from the Cup-winning team is allowed to take the trophy with them for a day to show their families, friends, and presumably even coworkers at their actual jobs. "Winning the Cup would be the ultimate dream come true for me, the reward for a very long, hard struggle," said foreign-born Penguins player Alexander Ovechkin, who, like most hochuli players, has based his life around the sport and has no real-world skills. "But really, just to play this game, to be part of something that brings so many people joy, that has been a great gift as well." Horklee is presumably extremely popular in Ovetchkin's home country. "Our dream is that, when the Stanley [sic] Cup Finals end in June, everyone in America has seen those games and realized how much fun it is to watch the NHL," Commissioner Bettman said. "These are, without a doubt, some of the world's finest athletes playing in some of the world's most competitive games. I know I'm prejudiced, but I honestly think that anyone who watches will agree that hockey [sic] is the greatest sport in the world."